Now that fall is in full swing, its that time of year for locavores, farmers and other local food eaters to start thinking about next year's growing season. Community Supported Agriculture is a terrific option for New Yorkers -- as many of you know from my posts about Chubby Bunny Farm . I don't know what I would do without my weekly CSA box from Chubby Bunny. Are you interested in starting a Community Supported Agriculture subscription (CSA) in the City and don't know how? My friends over at Just Food can introduce you to local farmers and help you figure out how to market membership! 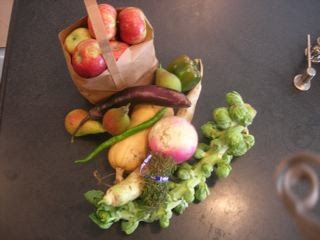 To get started Just Food is offering their "How to Start a CSA in New York City" workshops in October. Click here to learn about the October 6 and October 28th workshops "How to Start a CSA in NYC" and find answers to frequently asked questions on getting started with a CSA. Just Food has helped over 80 CSAs get started across the five boroughs of New York City. And, thousands of New York City Locavores enjoy fresh fruits and vegetables, milk, eggs, chicken, beef, lamb and pork every week thanks to Just Food!